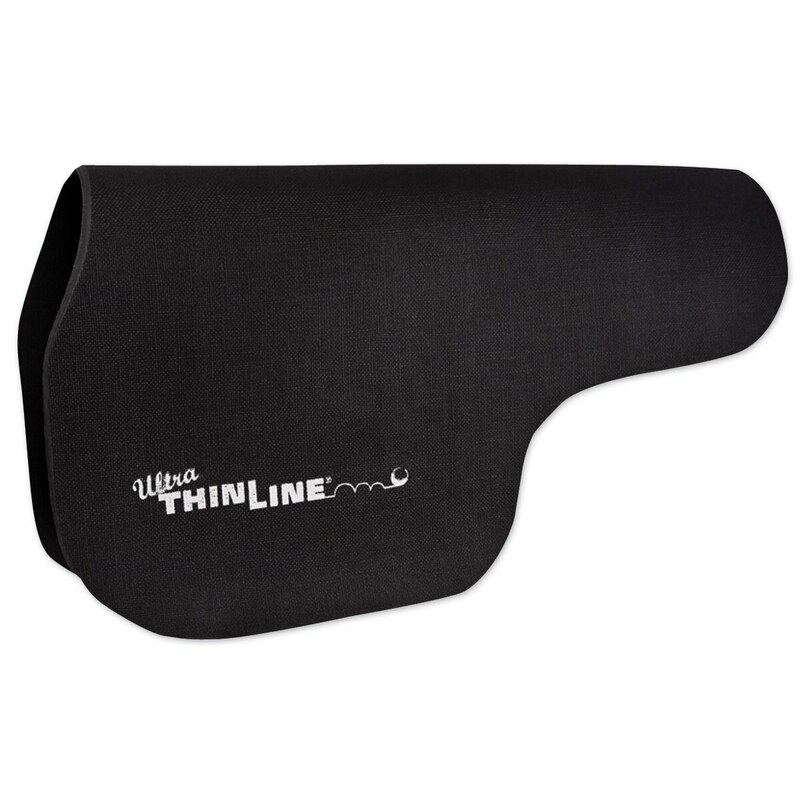 ThinLine guarantees you will sit better riding in one of our most popular pads. Ultra ThinLine noticeably reduces lower back and thigh movement, allowing the rider to sit gaits with less effort and achieve a more stable position in the saddle. The result is a quieter ride with increased effectiveness of the seat and increased communication with the horse through a closer contact feel. Ultra ThinLine is endorsed by spinal surgeons for riders with sore backs and endorsed by top professionals and competitors for better performance both for the horse and the rider. The contour pad will also greatly reduce all saddle slip problems. Size: Designed for saddles up to 18". Measures 21½” Spine, 25½” Flap to Flap with 14½” Wide Seat. Seat is 3/16" thick. Special Features Can be trimmed to any shape if necessary. 14½" Wide Seat, 3/16" thick. 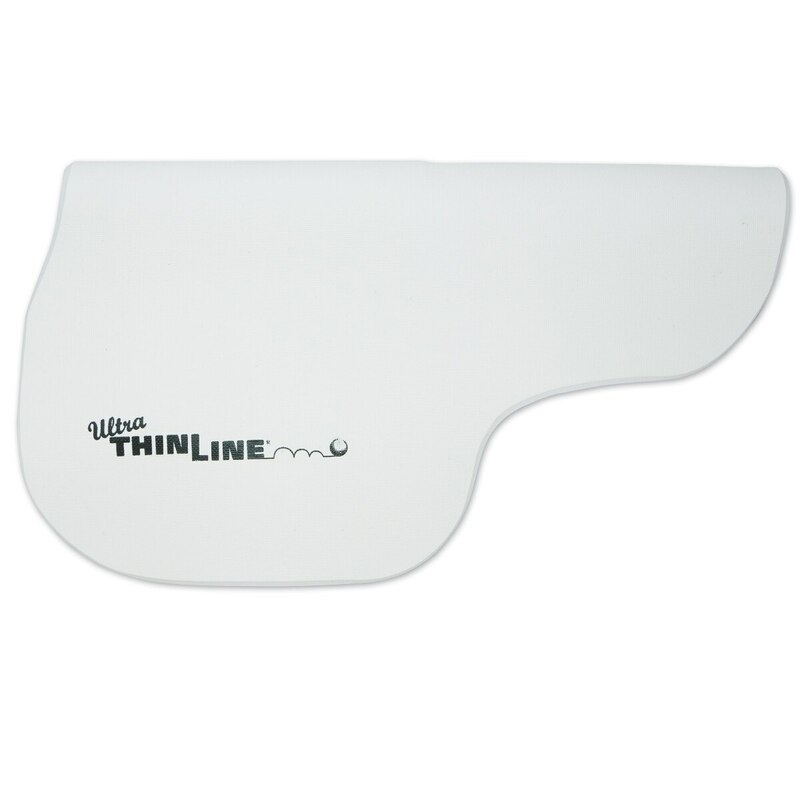 ThinLine Contour Pad is rated 4.8 out of 5 by 40. Rated 5 out of 5 by Carolyn15 from So thin and great contact with my horse! I was using one of Thinline's Trifecta pads and then read about this one. I felt the Trifecta was a bit too much pad under the saddle but wanted a bit of cushion for both my horse and my back. I've only used this twice but what a difference in feel! My horse usually is a little cold backed and will prance a bit when I first get on. She's been just fine with this pad, no prancing at all. She's very seat sensitive and this pad really makes a big difference in having that connection. I can really feel the difference in contact. I have an 18" saddle and the regular fits fine. I know some saddles are bigger than others and mine is probably a small 18". I have a little bit of extra pad on either end of my saddle. They do make a larger one that you can order directly from Thinline if you need it. Rated 5 out of 5 by Wind from Saves my back! I bought the pad not long ago. So far it has been fantastic for saving my back. I have a comfortable horse to ride, but I am no spring chicken. The pad has made a big difference. I can only assume my mare feels the same way. Rated 5 out of 5 by wseal from Not bulky I haven't had this for too long but I do have another thinline half pad and I will say they live up to their reputation. I use this particular pad for dressage. I like knowing that the material will absorb quite a bit of shock both from me and my horse. This has helped me sir the trot better and has allowed me to keep a better connection with my seat bones. Rated 5 out of 5 by monkeyjack from love this pad. I bought this pad a month a go and both my horse and I markedly more comfortable when we ride. Rated 3 out of 5 by Christine from It's okay, just not worth the money I would like this pad a lot more if it was shaped differently. Because it's straight across the back, it creates a lot of pressure over the withers. It's also an odd shape down the sides. My Wintec AP 2000 saddle goes over the edges of the pad in the front. I've thought cutting a slit over the withers to provide some relief, but I'm afraid it would continue to tear. Overall, it was a disappointing purchase. Rated 5 out of 5 by Jojo123 from Works like it says it will! I have tried this pad on two horses - one a TB, the other a WB. With both, I find it genuinely reduces/absorbs the concussion of our ride. It makes the ride softer for both the horse and the rider. The shape is unorthodox, but doesn't show if you use a same-color shaped or square pad. It does smell peculiar, but I'm either getting used to it, or it's fading over time. The only negative is its sizing. It is sized for a saddle in the under 17" range, so it doesn't sit completely under my 18" saddle when placed correctly. I imagine this reduces its effectiveness. SmartPak's price is better than the manufacturer's and because of SP's shipping, is less costly than SP's competitors. Rated 4 out of 5 by Jag24659 from Really nice thin pad, but didn't fit my saddle I was told by Thinline that the contour pad will usually fit most 18" AP saddles, but it was an inch or two short for my Pessoa saddle, so I had to return it. However, I'm going to buy it in a long size from Thinline. It's a really nice pad that my trainer swears by. As always, Smartpak is great about returns, has excellent customer service and will continue to be my #1 go to place for all things equine! Rated 5 out of 5 by Jgray116 from Outstanding pad I've been using this pad for about four weeks. It is a game changer. My horse seems so much more comfortable during every ride. The pad is so thin that it doesn't interfere at all with the fit of my dressage saddle. Rated 5 out of 5 by Biko15322 from Excellent protective saddle pad Protective pad that encourages the horse to use its top line as opposed to bracing against anticipated rider bouncing, jarring or simply interference. We have used it on green and more seasoned horses with great results on both, regardless of lev of training of horse. Wipes clean, seems to not retain odors.